Dear Eric,Thank you for your e-mail regarding the U-Pass program. I appreciate your opinion on this matter, and want to make sure that you have a proper perspective on the background of the program, and the process going forward. The current U-Pass pricing of $145 was part of the introduction of a pilot project in 2009-10. At that time, it was made absolutely clear that the price would eventually be raised to a price that is “revenue neutral” for the City of Ottawa. This means a price that provides a balance between revenues that OC Transpo received from post-secondary student riders prior to the program, and the increase in usage and revenue that was anticipated from the program. This is the "revenue neutral" concept that you have no doubt heard about. The board of directors of the Dalhousie Community Association (DCA) has been following closely the discussions and consultations around the full day kindergarden program and extended days. We reviewed the report on the “Proposed Delivery of the Extended Day Program” and urge you to vote for the staff recommendations on November 22nd that will permit Third Party Providers to continue to offer care to our children. • There is no place to cross Bronson between Gladstone and The Queensway. This is a very heavily and aggressively travelled part of Bronson. To cross at any place other than a crosswalk is to take your life in your hands. • There are some 15 wheelchair bound residents at 520 Bronson. Just to travel along the sidewalk on this major collector is dicey. • Students of Glashan School living west of Bronson are risking their lives crossing at Arlington. The Dalhousie Community Association is opposed to this patio extending along Willow St due to the exclusively residential nature of that street. Despite the presence of a few residential units on Booth St., the already high volume of traffic will mitigate the impact of a patio on those residents. So we are not opposed to a patio all along the Booth St. curb. This approval is contingent on the usual 11pm closing, the absence of live or recorded music, and the absence of bright lighting. a. Polowin indicated that they had met with city staff, but no decisions had been made yet. Had also met with the Councillor. Are planning on bringing this to planning committee in December. b. They are doing the rounds with stakeholders because of changes from initial design. c. Lahey indicated emphasized that M-S is not just a “Toronto” firm, but has lots of roots in town. i. There were concerns about height and podium in original design. ii. Planning department indicated that it would be a good idea to increase the lot size. Re: Re-Zoning of 801 Wellington St.
On Sept. 20 ’11, representatives of the Dalhousie and Hintonburg Community Associations were given a presentation of perspectives and other drawings of office towers for the 801 Wellington site opposite Bayview Station. The developer did not leave any documents with us. There was no assurance that any resultant buildings would look like what was presented. We were merely being informed that this was the basis of a re-zoning request which would eliminate the existing 1.5 FSI, allow 196, 184 and 95m heights ASL, and drastically reduce commercial parking requirements. Some shadow studies were later submitted electronically. Minutes of July meeting. Motion to adopt moved by Archie, seconded by Eric. It was noted that some Word documents circulated could not be opened by all. We would like to bring to your attention the recent unilateral closure by the NCC of the Preston “extension”. This paved route, a former NCC road, has been used by the community since the transitway opened in the early 1980’s, as it is the nearest and safest community access to the Ottawa River parklands and bikepaths. It is a popular route, used by hundreds daily. The alternative routes are simply horrible: via Booth Street, a busy, unpleasant road that is much further from the River, and slated to undergo several years of major reconstruction ; or via Albert to Bayview, which unfortunately takes cyclists and pedestrians along one of the most unpleasant and ill-suited bits of road in the City, where Albert goes over the O-Train, and thence along the creepily deserted Bayview Road to the River. Please inform Madame Chairman Lemay that she does have alternatives. The proponent plans to demolish a pair of semi-detached homes that have been converted into a rooming house, and to construct a new apartment building with bachelor and one bedroom units. The exterior design is pleasing and the affordable units will meet a neighborhood need. The proponent has plans for the rehousing of all existing tennants. Adjacent property owners have been consulted. The proponent, Mr. Raymond Stern, met with representatives of the Dalhousie Community Association (DCA) on September 20th and presented his proposal for redevelopment of this site. He is looking to demolish the existing building and replace it with a 4 storey, 25 unit apartment building. The DCA meets on the first Wednesday of each month. There are meetings scheduled for Sept 7; Oct 5; Nov2; and Dec 7th. Meetings start at 7pm. Starting this fall, we have a new room at the Dalhousie Community Centre, corner of Empress and Somerset St. We meet on the third floor, last room on the left. Note that the December meeting is often rescheduled into a pay-as-you-go holiday dinner at a local restuarant. On June 27 the DCA sent a letter to Councillors Holmes and Hobbs (since both abut the Otrain corridor) pointing out the merit of installing an O-train station near Gladstone Avenue in 2014 as part of the O-train expansion project. (you can read that letter by going back a few posts on this website). Subsequently, Councillor Holmes wrote to a number of city bureaucrats pointing out the merits of examining a station there in 2014. The Dalhousie Community Association (DCA) has discussed this project, met with the proponents, and unanimously agreed that it is objectionable on numerous grounds. The Association does not normally hold a meeting in August, accordingly there will not be a meeting August 3rd. The Board continues to be involved in community affairs during August. Current issues include 500 Preston (Soho Italia) rezoning to permit a 35 storey condo; the lack of information regarding the Rocherster/Balsam site (23 townhouses); the LRT stations, Devonshire School park/parking, Somerset reconstruction, etc. The next regularly scheduled meeting is Sept 7th, 2011. The Polish church on Louisa is planning to expand to the east, with a nice addition to the property. They are also asking to rezone a house across the street to permit it to be used as a parking lot. That entire block is under assault, with residential uses being squeezed out in favour of unlandscaped parking lots. Planning and Growth Management Dept. Re: Zoning By-Law Amendment Proposal: 27 Louisa St. Apologies for this late reply, but there has been no sign on the site and no notification until this week due to the Postal disruptions. Re: Zoning By-Law Amendment Proposal: Balsam & Rochester Streeets. 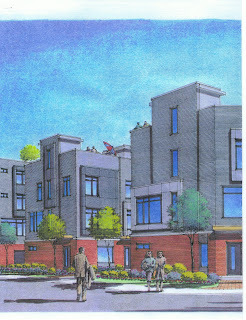 We strongly support the concept of low-rise townhouses on this site. However there are some fundamental problems with the layout presented. Perhaps this is why the developer and the architect have not returned our calls and we have been able to acquire only a vague documentation from the Planning Dept. The dev/apps web page still contains the four year old apartment tower plans, and not the current ones. Our comments are therefore based only on a site and landscape plans dated Feb/Mar 2011 and an undated partial perspective sketch. Ironically, the thing keeping the Dalhousie Community Association most busy is the thing that will have the least impact in the short term, but will affect all our lives in the future. I’m talking of the LRT system, of course. Five of the thirteen proposed stations fall in Somerset ward, and the Campus station at the east end of the Corkstown footbridge over the canal will be another important local station. The Transportation Committee of the DCA has had two meetings with the City and their consultants specifically regarding station access. Why do we think this is so important? Well, it’s one thing for the planners to figure out bus routes, station transfers, and entrances and exits, but we are focused on the walk-in –- or bike-in –- accessibility since so many Dalhousie residents live within a short distance of the stations. We check for easy safe street crossings; direct, safe routes; and attractive environments. The minutes were adopted with minor changes – moved by Eric, seconded by Mike. Thank you for taking the time to discuss with us our concerns about the Bayview Station design and access. The conversation was productive and worthwhile. We look forward to continued dialogue and frank exchange of views which will result in a better OLRT and neighborhood. To summarize our views, here are some points that you might find helpful. Adopt minutes of May meeting. • Still pushing MUP for Carling, thru bike branch meeting June 2nd, briefing to PBIA board, meeting with area planner. Coming next: meeting with city cycling office, then again with the traffic engineers. Eventually, DH to ask for more budget to better complete the Carling study. • Gloucester site height limit. • We added our voice to the chorus objecting to reduced play space at Devonshire, via a letter to the OCDSB. The focus will be driven by you! Questions will be selected through the audience or beforehand through ottawa.openfile.ca. OpenFile is a collaborative local news site. Visit ottawa.openfile.ca, open a file, and your ideas will help power the event. The event will begin promptly at 6 pm. Hosted by the Old Ottawa East Community Association and the Centretown Citizens Community Association, in partnership with OpenFile. The Dalhousie Community Association held its annual general meeting on 6 April. We had two guest speakers: John Doran and Rick Morris, of Domicile Developments. Domicile has been busy in the central city neighborhoods for 35 years. They have built townhouses, stacked townhouses, low rise apartments, and some higher-rise apartment buildings. They are active in the condo market these days, but have also built several buildings in partnership with non-profit housing providers. Their reputation amongst community groups and municipal planners is that they are “good guys” who work with the system and neighbours, rather than taking a confrontational approach right out of the gate. Presentation will begin at 6:30 p.m.
OC Transpo is seeking customer feedback into the network service proposal that supports the approved 2011 Budget. The plan proposes redesigning the network to make routes more direct, productive, and reliable, while ensuring that we can keep fares down and make our transit system sustainable for the long term. 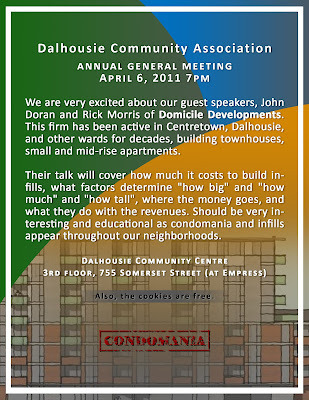 Exciting Guest Speakers: The Dalhousie Community Association will hold its annual general meeting (AGM) on April 6, 2011. We are very excited that our guest speakers will be John Doran and Rick Morris of Domicile Developments. This firm has been active in Centretown, Dalhousie, and other wards for decades. They build townhouses, small and mid-rise apartments. Their talk will cover how much it costs to build infills, what factors determine "how big" and "how much" and "how tall", where the money goes, and what they do with the revenues. Should be very interesting and educational as condomania and infills appear throughout our neighborhoods. The meeting begins at 7pm at the Dalhousie Community Centre, 3rd floor, 755 Somerset Street at Empress. This could be the best hour you spend this year! And the cookies are free.